Trying to think of new and exciting ways to take your event up a notch? We have some ideas for you! 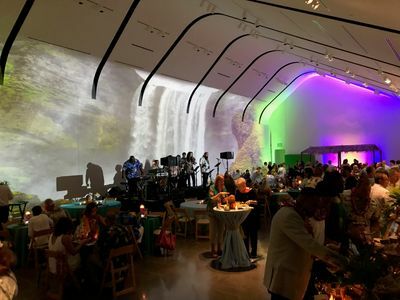 Using simple uplights and branded gobos for an event can add something to your layout and help engage guests, but there’s much more to visual effects than just the basics! Listed below are some unique ways to use visuals that you may not have thought of yet. Your guests might be expecting a run of the mill gala or fundraiser. If you want your event to stand out, create suspense before they even walk in the door. Make them eager to get into the ballroom by adding lighting components on and around the outside of the venue. 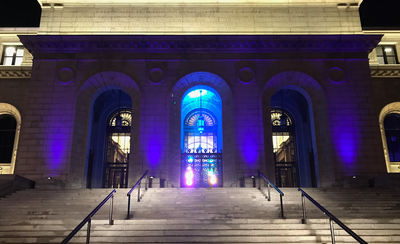 Lighting up the exterior of the venue means that you are not only building suspense for attendees, but also creating awareness in the community. 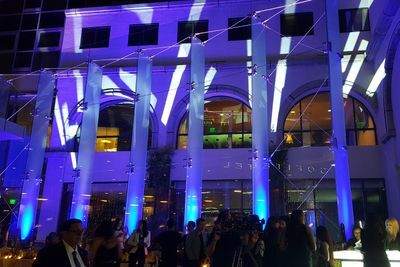 Draw more attention to the building or a certain aspect of the exterior with moving beams or uplights. Project your logo or branded image to announce your presence. Transform the property and its surroundings by lighting up the trees around the venue or defining the walk ways leading up to the doors. And instead of just focusing on one or two rooms, bring the interior and exterior together with a common color scheme or pattern. 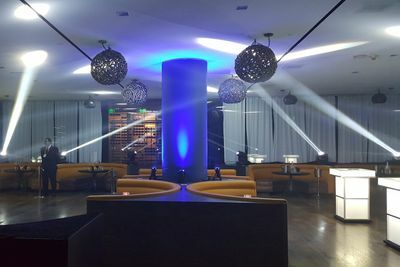 Using uplights or moving beams in interesting ways will make a bigger impact on your guests’ overall experience. When they arrive and start to walk in, their enthusiasm will begin to grow. Even the check in process will be bearable because of the anticipation built up outside, and the idea of “just another gala” will fade away immediately. Are you searching for that “wow” factor to add to your event? Video mapping is the way to go! It will allow you to take an ordinary object or space and transform it into a projection screen for a compelling feature. 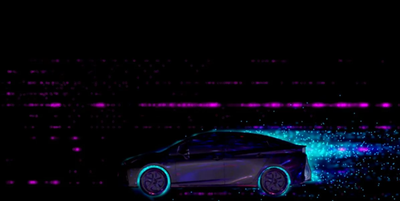 Video mapping is a unique addition that guests won’t see at every event! It can be used inside or outside and you can create any ambiance you’d like. To really transform a space and engage guests, add a message on the front of the building welcoming them to your event, enhance your theme with a moving wallpaper that changes throughout the night or map your video content on the plain white walls of the room and make those usually dull areas a part of your program. Video mapping is a way to transport your guests to a different city, country or planet. A video mapped object or space will activate guests as your event marketers! They will want to take photos and videos of the scenic design projected around the room or the message on the exterior of the venue and share them on their social media sites. With an event hashtag and the perfect content being projected, this can be beneficial to you and your brand! Create remarkable moments for your guests by adding speciality fixtures into your production. When you incorporate haze into a space and pair it with high output beams, you will give any room an individual and exciting look. Utilize the lobby and pre-function area to really draw guests in. This will create the same suspense that focusing on the exterior of the building will. 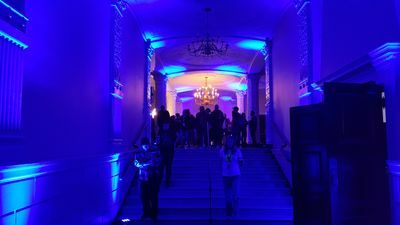 Adding lights in this part of the venue, as well as hallways, will allow you to control the flow of your event and attract guests to certain rooms or activities. With beams, lasers or fog, the space will pop and the scene will be set before guests even enter the ballroom. By adding these features to both the main space and the lobby, the elements of your event flow into other parts of the venue. This gives the impression that your event is bigger, making guests’ experiences more significant. You’re already using visuals at your event, so be creative with them! By focusing some attention to other parts of your venue, turning a lifeless room or object into engaging content or creating a certain vibe in your space, your event won’t be just another night that your guests forget about in a few days! These elements will give them lasting memories and excitement for your next function. If you’re still looking for more innovative ways to use visual effects, we are always happy to brainstorm with you and your team!